At the Scene of the Crime: Hoorah for the Humdrums! Curt Evans, mystery scholar extraordinaire, has been on the blogosphere for a while now, managing an interesting little blog entitled The Passing Tramp. As the name may indicate, the blog is devoted to wandering around the mystery genre, encountering all sorts of interesting specimens, and then reporting back to readers. It’s an excellent blog, and I tend to agree with Curt on many points, especially his continued and unrepentant defense of a group of authors collectively known as “The Humdrums”. You could say he’s written the book on the subject. 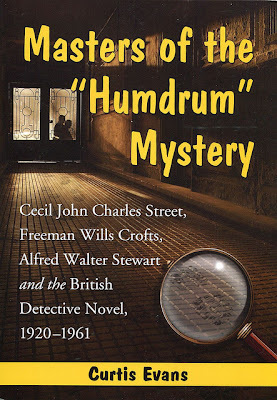 Literally—I am of course talking about Masters of the “Humdrum” Mystery: Cecil John Charles Street, Freeman Wills Crofts, Alfred Walter Stewart and the British Detective Novel, 1920-61. To put it quite simply, Curt’s book is a bravura performance. 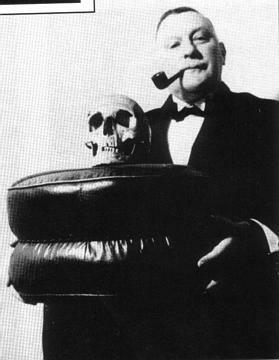 He takes a look at three major mystery authors from the Golden Age: John Rhode/Miles Burton, Freeman Wills Crofts, and J. J. Connginton. All three men have been condemned to out-of-print hell, and when brought up by academics at all, their opinions tend to be largely dismissive of these “mere puzzles”. But Curt remains unconvinced, and through his analyses he tries to prove that these books have far more merit to them than such a label might imply. Curt combines this analysis with a biographical look at the authors, and so we learn about the lives of Rhode, Crofts, and Connington like never before. Often times, the life of the author will influence his work, as Curt demonstrates. 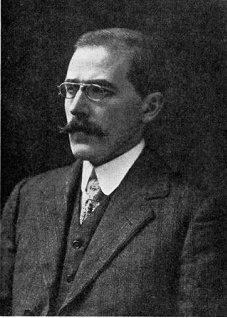 J. J. Connington, for instance, wrote A Minor Operation after having cataract procedures, and those experiences find their way into the novel. Other points are more subtle; for instance, Curt tries to demonstrate that Freeman Wills Crofts’ writing was extremely influenced by his religious worldview. He argues his point quite successfully. I’m a big fan of John Rhode and of J. J. Connington. I have never understood why these folks have been labelled as Humdrum—Rhode had a fine sense of humour that finds its way into his books, as well as a fondness for beer and plenty of technical ingenuity. Even in the less successful books I’ve read – see, for instance, Death on Sunday – there is much of interest going on apart from the puzzle. As for J. J. Connington, I’ve had the pleasure of reading some of his masterpieces in the genre such as The Case With Nine Solutions or The Castleford Conundrum. I love his ingenuity, and the cynical worldview of his detective Sir Clinton Driffield is remarkably different from the usual stuff you get in Golden Age mysteries. Now, at last, I get to appreciate these authors a bit more. Curt has tackled fascinating questions like that of Connington’s worldview. This is a particularly fun section, because we see the author himself rising out of the sands of time, wondering to himself what on earth Curt is doing because he certainly never intended to put his worldview into his “’tec yarns”. No, really—it emerges during correspondence. Curt also looks at the author’s apocalyptic and disturbing novel Nordenholt’s Million, which eerily foreshadows the cruelties of the Nazi regime. But what about the book itself? Sadly, the price is on the high side, but it is worth every penny. I bought both the print edition and the Kindle edition, and I have nothing but praise for both. If you like your Kindle and want to save $10 on the cover price, it is a good option. The text is well-edited and proofread. The formatting is also excellent, which is important for this book because there are all sorts of images that you don’t want interrupting the flow of the text. In short, it’s a book that practically feels like it was made for the Kindle, which is a refreshing change from my last Kindle read. Meanwhile, the print edition itself is also quite attractive. The font, proofreading, editing, etc. are all excellent and make for pleasant and easy reading. It is a bit taller than the average paperback, but it helps to keep the page count down and it doesn’t make much of a difference in reading. The book’s production values are quite simply excellent, and the content itself also helps to make you feel like you’ve spent wisely. Overall, I recommend Masters of the Humdrum Mystery. This is a very important work in mystery criticism. Curt Evans takes a good, close, and *serious* look at these so-called Humdrums as part of the historical era they belonged in. Too many critics write them off and pretend that only the “Big Four” of Crime Queens were of any interest during the Golden Age, but Curt here has proven that the Humdrums are far more interesting than has been given credit. This book, however, comes with a warning: Curt’s enthusiasm is downright infectious. You will find yourself reaching for your wallet – I myself already find that I am the owner of two new John Rhode novels (Death in Harley Street and The Bloody Tower), and two new Freeman Wills Crofts novels (The Loss of the Jane Vosper, Antidote to Venom)… and I somehow have the feeling it won’t end there. This book can be purchased from Amazon.com at this link. Thanks for the review, Patrick. I have read part of the book and have really enjoyed it so far. However, I’ll read the rest of the book via the paperback I have just ordered, as I am not happy with the formatting on the Kindle. I’ve counted ten separate problems/issues. Individually, they are minor, but added together they detract from the reading experience. Monica-- if that is the case with the formatting, it gets a helluva lot better by the end. I started reading via Kindle more or less from the end of the Rhode chapter onwards. At least there are no annoying recurring errors like printing a bullet's calibre as ?22 !!! Hmm, one of the problems is right at the end - the index seems to be made up of image files, so the text size cant be increased, or searched in that section. To be fair, it is not the worst-formatted e-book I have ever purchased. And yes, ?22 would drive me nuts! Honestly, I didn't even look at the index! I have no patience for flipping through my Kindle trying to find something-- I far prefer to use the good old-fashioned "book" book's index to flip through the pages. But I've checked and you're right about that. Looks like a great book, but I'm thinking I might benefit from actually reading more of the "humdrums" first. Patrick, thanks for the review. I will point McFarland to the comments about the Kindle version.